This report presents the methodology and findings of a participatory scenario-building workshop held in Pajala, Sweden. What does the future look like from the perspective of a small municipality in northern Sweden? What social and environmental challenges might there be and how might local people respond? 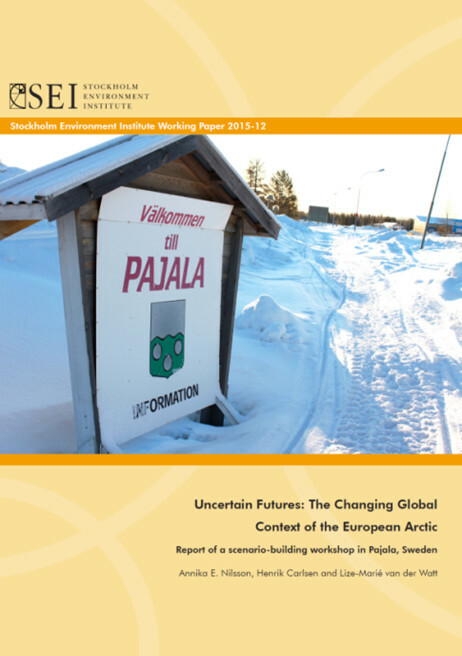 This report presents findings from a workshop in which actors from Pajala municipality and the surrounding region in northern Sweden discussed, together with researchers, challenges for long-term planning posed by a rapidly changing and uncertain global context. The workshop piloted a new approach combining bottom-up participation with scenario work generated within the international climate change research community, in order to construct locally and regionally relevant narratives of possible futures. The resulting narratives feature some issues that do not figure prominently in the assessment of global futures, but also show that local development is perceived as closely linked to global processes, such as changes related to climate and demography. The report’s purpose is to document the workshop results and offer a description of and reflection on the methods employed as a basis for further development of the approach. The workshop was funded by the research programme Mistra Arctic Sustainable Development (MASD; see www.mistraarctic.se), under work package 3, “The Changing Global Context of the European Arctic”. It informed the development of a chapter on future narratives in the Barents regional report for the Arctic Council assessment process Adaptation Action for a Changing Arctic (AACA).